We won a copy of this in the raffle draw at recent edition of the Real Vancouver Writers Series and it sat on one shelf or another and then we decided that having two apartments for our books was dumb so we found one approximately halfway in between our two at the opposite ends of the West End and combined our books and bookshelves and then she read it and wanted to talk about it so I read it too. I liked The Imperfectionists a lot. I also like The Goldfinch a lot. Tom Rachman probably liked The Goldfinch a lot. The Italian Teacher tells the story of a child whose development as an individual is permanently stunted by home schooling and you are expected to believe that casual interest in painting during teen years could allow one to pick up brushes nearly 40 years later and completely dupe the entire art world. But I like a good story and I’m capable of suspending reality for 350 pages or so, so I liked the book for its rainy December entertainment value. Getting some KMs out of my teal green Victoria Marathon top that I thought I’d never wear. Halfway through December and I’m still on track for Every Dec Day or running or cycling or swimming except that it’s been mostly running because the weather has been awful for cycling and swimming is awfully boring. I’ve taken to running on office days during lunch on those days when I have other things going on in the evening, or when I anticipate that I will not feeling like doing much by the time I get home from a criminally unreliable transit ride from the bowels of Port Coquitlam’s industrial flats to the nearest Skytrain station. Plus there’s a nice trail on top of the dyke along Pitt River. 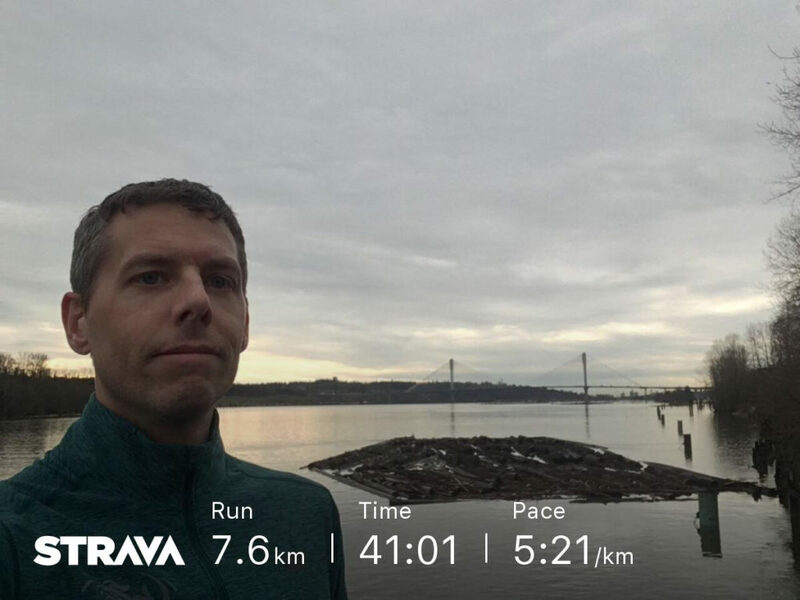 I had contemplated adding one or two days per week of running the 11 KM into the office in the morning from Braid Skytrain Station but after being forced to run during lunch last week so that I could attend an event immediately after work and keep my December streak goal alive now I’m finding that I’m hooked the lunch run. It helps that my office has showers too.